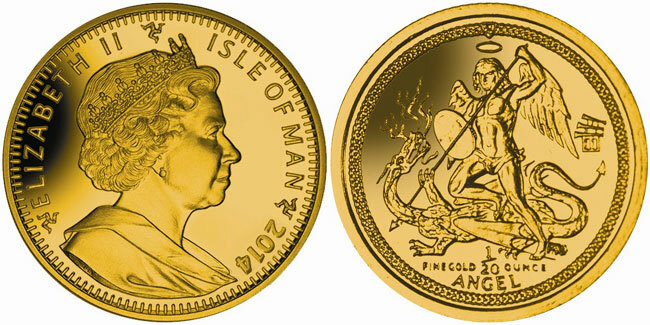 The Treasury of the Isle of Man Government have issued a gold coin in time for the holiday season which highlights a classic Christmas carol with an innovative “privy mark.” The new “2014” dated gold coin includes an appropriate “pipes” design just to the right of the coin’s principle design. Every year the Isle of Man Treasury issues a 1/20 oz Gold Angel bearing a special Privy Mark on its reverse reflecting a Christmas theme. Since 2004 the Privy Mark on these special Christmas Angels have taken us on a journey through “The Twelve Days of Christmas” with the Privy Mark each year representing a different verse of the well-known Christmas carol. This year’s coin carries a Privy Mark representing ‘Eleven Pipers Piping’ and is the penultimate in this 12 coin series. This special edition has a limited edition of 1,000 coins worldwide, making this a perfect collector’s coin. The “Angel” is also celebrating a milestone anniversary, its 30th birthday. As part of remembering the launch of this iconic and widely collected bullion and collector coin, the first reverse design of St. Michael slaying the Dragon used on these first coins in 1985, has been taken out of retirement for this special anniversary year. Since medieval times, Angel coins bearing the design of the Archangel Michael slaying the Dragon have been thought to bring good luck and health to the bearer and this modern Angel continues to uphold this remarkable tradition. The obverse of the coin carries an effigy of Her Majesty Queen Elizabeth II by Ian Rank-Broadley FRBS. Struck by the Pobjoy Mint UK, each coin has been produced to the highest quality and is detailed to perfection having been struck four times to achieve stunning sculpted relief contrasted against a mirror brilliant background. For more information on this and other coins issued by the Treasury of the Isle of Man Government, please visit the website of the Pobjoy Mint at: http://www.pobjoy.com/ukworld/section.php/815/0 Information offered in English, international orders dispatched. How they put privy marks on this coin? Since Pobjoy Mint was first mint to order coins by credit card. So what is the price of this 1/20th ounce gold coin? This year’s privy mark is actually a relief which means it was engraved onto the surface of the die and struck onto one of these very festive coins! I don’t know the price of the new 1/20th oz. angel but I am told the information will be added shortly to the Pobjoy’s “new issues” webpage shortly. What makes privy mark coins like 1/20th ounce gold Angel coins special? So I just got Pobjoy MInt catalog. So the price of 2014 Isle of Man 1/20 ounce gold Angel Christmas privy mark proof coin price is $169.00 + $10.00 shipping and handling = $179.00 total. So purchased 2013 issue for tatal price of $185.00 total last month. I think many of the Mints are happy to pass on the discounted prices for bullion whenever they can – the problem of course is, with the smaller fractional pieces, its a bit more difficult as production costs remain the same whether its an ounce or 1/20th but glad you were able to see some difference in your favour with your latest purchase.